2. Tuck them in your scrapbook or journal. I like combining letters with my stories because they offer different perspectives to life events. I keep a journal from Gadanke, my shop. All I have to do is hole punch postcards and letters (like the one above from my grandma) and put them in my journal. I do the same with photographs and ticket stubs. This book holds my wedding cards. 3. Keep them so you can give them back to the writer one day. A couple of years ago, my grandma got a package in the mail. It was filled with about 24 letters and Christmas cards that she had written to her closest college friend over the years! Getting those letters back was like receiving a time capsule. It was the first time we got to learn about my dad’s first Christmas. Be selective about from which people you choose to keep the cards for later. A few dear friends or family members is plenty. Keep everything in a little box or bag at your desk, so you’ll always file away the items you want to include in this packet one day. Be selective about the types of cards and letters you keep. You want to give back a collection of that person’s story, so only hang onto the mail that contributes to that. Print off any emails or keep them in a special folder on your computer to return to that person as well. You might want to be sneaky sometimes. Email and telephone weren’t luxuries my grandma and her old friend could use. Write letters and notes to your chosen people so they might be inclined to do the same. 1. Repurpose them into tags and gift cards. 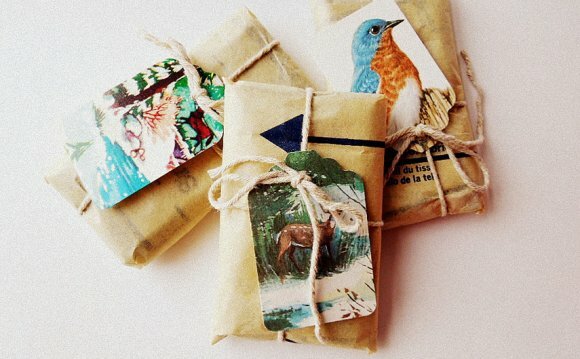 All the pretty poems and cute pictures are perfect for repurposing into gift tags. Use them year-round with your gift giving. I like to cut out the images as I get them — hearts, snowmen, leprechauns. I punch a hole in my cutout and string a scrap of ribbon or twine in it. My tags are all in a little envelope with all of my wrapping supplies. Easy! 2. Repurpose them into scrapbook and journal embellishments. Looking for the perfect quotation or pretty image for your memory keeping? Pieces from cards are perfect and readily available, especially for Christmas and weddings. 3. Repurpose card tops into postcards. This project is super easy and fun. All you have to do is tear or cut the card in half. Recycle the half with the inside text and names; put a postcard stamp on the side with the pretty picture, and you’ve got your postcard. A lot of organizations, from Girl Scouts to YMCA and Kiwanis summer camp programs, can use your card tops for their craft projects all year long. Summer camp season is here, so ask now.